What are the best places in Los Angeles for the international traveler to stay in? The best places to book a hotel in Los Angeles are Santa Monica, Beverly Hills and West Hollywood. Santa Monica is a beach city and a great place to stay if you are looking to relax, swim and walk on the beach. There are a lot of options for nightlife, restaurants and entertainment. Beverly Hills area is the safest for tourists and a lot of best dining restaurants near by. 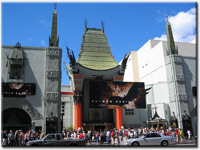 Hollywood is a good place to stay if you are looking to check out Hollywood Walk of Fame, Kodak Theater, nightlife on the Sunset Strip and the other tourist attractions along Hollywood Blvd. Universal Studios, Rodeo Drive, Beverly Hills also close by.